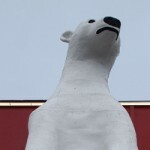 On our way to Twin Falls Idaho we decided to stop in the middle of Nevada’s high desert in Elko to see the world’s largest trophy polar bear, stuffed and mounted at the Commercial Hotel and Casino. The bear is 10 feet 4 inches and weighed an estimated 2200 pounds – nearly twice the common size of a typical male polar bear. It ended up in the Commercial Casino as a result of a contest to find the largest polar bear in the Artic Circle – this beast was killed by an Eskimo hunter in 1957 and purchased for display a year later from a collector in Denver. Since 1958, the bear has remained in a custom glass enclosure and a plaster version now also towers over the outside of the casino. Pretty cool.